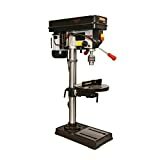 Benchtop drill press is a power tool that is usually fixed on a bench whose sole purpose is to create holes in various work pieces. To be able to handle a variety of types and sizes of these work pieces, they have a wide collection of cutter types. A spindle is attached to a chuck which is what has the ability to accommodate different types of cutters like annular cutters, threading taps and twist drill bits. These cutters determine the drill capacity which goes hand in hand. Drill press is accurate to a fault and is also easy to use making for a good addition in any workshop that requires drilling of holes. They come with different settings for the speed which makes them versatile enough to handle various work pieces. 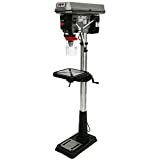 When the need to buy a drill press arises, there are some important factors that have to be considered in order to get it right. The technical aspect that includes the working column height or swing, drill speed, motor power, drilling depth and adjustable angle ranks highly. You also want to consider its build quality to curtail inaccuracies and instability by ensuring that your drill press doesn’t vibrate too much. Make sure to check the price by comparing several products to get the best features for the best price possible. Online sites like Amazon should provide you with good choices for reasonable prices for your drilling pleasure. If necessary, come up with a checklist which you can use to crosscheck against the offered products. This benchtop is powerful and versatile as it comes fully equipped with up to 16 speed levels that have a range of 200-3,630 RPM to promote efficiency. It is also flexible due to its ability to rotate and tilt at 45 degrees on a work space of 10-by-13-Inch. This crank operated machine has motor that packs 3/4 HP 115/230 volts with a tension spindle return spring that can be adjusted to suit one’s need. This 150 pound drill basically handles every tough job in the workshop without breaking a sweat. Running out of chuck is highly unlikely for a smooth and long-lasting delivery. If you are looking for precise drilling without spending too much money while at it, then this is the power tool for you. It is easy to control thanks to its swivel knob with its LED which can be adjusted to improve the level of visibility. The drilling experience is not to be taken lightly as it includes 5 speeds which are boosted by a flexible fence that is ideal for drilling repetitively. Height adjustment is also guaranteed to be accurate due to the inclusion of rack and pinion in its features. It’s big, high-quality chuck spins without a hitch for a smooth and quiet drilling even on thin steel parts. Equipped with up to 9 speeds with a tension belt that can be released quickly to allow changing the speed fast, this benchtop is a powerful tool. Accuracy is promoted by the availability of the locking handle which is ideal for depth settings. You also get safety features like the emergency button for starting and stopping the drill whenever necessary plus the on/off push button switch. There is also a switch for the belt cover and thermal overload to ensure the tool is working at its optimum. Further, the spindle is equipped with a large diameter which has 4 bearing points for super precision. This benchtop is known for its accuracy and precision which is all the more reason to use them instead of using hand drills. This is made possible by the fact that your work piece can be put in position through the spindle to curtail movement. You only need to set your depth and angles on the press drill and let it do the rest including stopping at the set depths. This can be repeated throughout the pieces promoting accurate holes at a faster rate which also saves on time. Their powerful motors make sure they work fast through their rotating drill bits making work easier. Such a drill makes it easy to put holes in work pieces with intricate shapes and designs thanks to the setting that allows drilling on angles. They are also easy to operate and also make drilling holes and easy task which saves one a lot of energy which reduces fatigue. Drilling bigger holes shouldn’t be too hard as one only need to change the drill bit to a larger one. The rack and pinion lever comes into play here as it promotes easy drilling by lowering the chuck and spindle as required. Drill presses are also safe to use thanks to their security features like the ability to clamp the work piece in place while also allowing the operator to control it with ease. This is also boosted by the various speed settings which can be changed depending on the piece being worked on to prevent accidents. After narrowing down to the aforementioned 3 benchtop drill presses, it is time to come up with a winner which can be a tricky affair given all their goodness. The best way to go about it is considered what kind of job you want the drill to handle. Then go for accuracy, flexibility and stability to ensure you get the most out of your tool. Your budget should also simplify this process further which shouldn’t be too difficult as there is a drill for every price range. When all is said and done, every workshop needs to invest in a drill press due to the many benefits that are attached to these tools. These improve the workmanship of every job one tackles which makes for high-quality products. The trick is to buy the right power tool for your needs to ensure you don’t under-utilize it. It is also vital to know how to handle it well and for this, you have to read the given instructions for operation. This is best to promote security while optimizing the tool to your advantage.